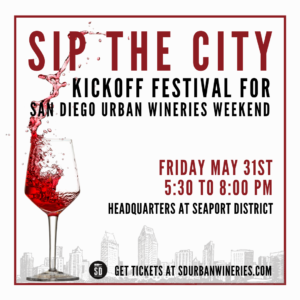 San Diego Urban Wineries "Sip the City" festival happens Friday, May 31, from 5:30 - 8:00 pm, at the The Headquarters in downtown San Diego. Sip the award-winning wines of San Diego's urban wineries, and also enjoy food and live entertainment. Tickets are $29 online, and $39 at the door. Sip the City is the kick off party to San Diego Urban Wineries Weekend!